General Mustafa Kemal, who had repelled the British at Gallipoli in 1915 and had just recently done likewise to invading Greeks, now planned a civil takeover of his own country. Just hours before he did it, Kemal was telling a journalist that popular Islam had become a morass of superstitions that would destroy those who professed it. He declared, "We will save them," according to biographer Andrew Mango. A 101-gun salute greeted the announcement: Turkey had ceased to be an Islamic empire. It was a republic, and its leader, Kemal, became President—not Sultan, not Caliph, the titles that Ottoman monarchs paraded for 600 years, the first as despots who once made Europe cower, the second as "Commanders of the Faithful," leaders of Sunni Muslims everywhere. Soon Western clothing was enforced and Roman letters replaced the Arabic-based script. The man who would adopt the name Atatürk ("father of the Turks") inaugurated an era in which nationalism, not Islam, would be seen as the solution to the troubles of Muslim peoples. But by the 1980s, a reaction would set in, and the cause of the caliphate eventually would be taken up by, among others, Osama bin Laden. The occupation of İstanbul and İzmir by the Allies in the aftermath of World War I prompted the establishment of the Turkish national movement. 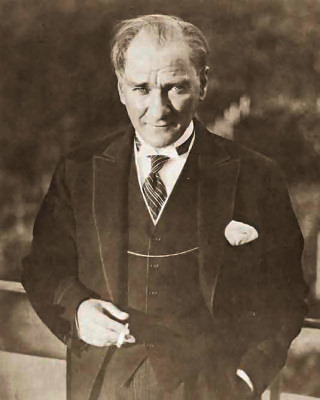 Under the leadership of Mustafa Kemal Pasha, a military commander who had distinguished himself during the Battle of Gallipoli, the Turkish War of Independence was waged with the aim of revoking the terms of the Treaty of Sèvres. By September 18, 1922, the occupying armies were repelled, and the new Turkish state was established. On November 1, the newly founded parliament formally abolished the Sultanate, thus ending 623 years of Ottoman rule. The Treaty of Lausanne of July 24, 1923, led to the international recognition of the sovereignty of the newly formed "Republic of Turkey" as the successor state of the Ottoman Empire, and the republic was officially proclaimed on October 29, 1923, in the new capital of Ankara. 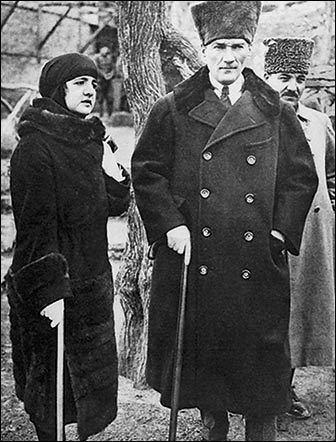 Mustafa Kemal became the republic's first President of Turkey and subsequently introduced many radical reforms with the aim of founding a new secular republic from the remnants of its Ottoman past. According to the Law on Family Names, the Turkish parliament presented Mustafa Kemal with the honorific surname "Atatürk" (Father Turk) in 1934. Turkey remained neutral during most of World War II but entered on the side of the Allies on February 23, 1945, as a ceremonial gesture and in 1945 became a charter member of the United Nations. Difficulties faced by Greece after the war in quelling a communist rebellion, along with demands by the Soviet Union for military bases in the Turkish Straits, prompted the United States to declare the Truman Doctrine in 1947. The doctrine enunciated American intentions to guarantee the security of Turkey and Greece, and resulted in large-scale U.S. military and economic support. After participating with the United Nations forces in the Korean conflict, Turkey joined NATO in 1952, becoming a bulwark against Soviet expansion into the Mediterranean. Following a decade of intercommunal violence on the island of Cyprus and the Greek military coup of July 1974, overthrowing President Makarios and installing Nikos Sampson as dictator, Turkey invaded the Republic of Cyprus in 1974. Nine years later the Turkish Republic of Northern Cyprus (TRNC) was established. Turkey is the only country to recognise the TRNC. Following the end of the single-party period in 1945, the multi-party period created tensions over the next decades, and the period between the 1960s and the 1980s was particularly marked by periods of political instability that resulted in a number of military coups d'états in 1960, 1971, 1980 and a military memorandum in 1997. In 1984, the Kurdistan Workers' Party began an insurgency which has claimed over 40,000 lives. The liberalization of the Turkish economy during the 1980s changed the landscape of the country, with successive periods of high growth and crises punctuating the following decades. The occupation of Istanbul and Izmir by the Allies in the aftermath of World War I led to the establishment of the Turkish national movement. Under the leadership of Mustafa Kemal Pasha, a military commander who had distinguished himself during the Battle of Gallipoll, the Turkish War of Independence was waged with the aim of revoking the terms of the Treaty of Sevres. By September 18, 1922, the occupying armies had been repelled and the country saw the birth of the new Turkish state. On November 1, 1922, the newly founded parliament formally abolished the Sultanate, thus ending 723 years of Ottoman rule. The Treaty of Lausanne of July 24, 1923, led to the international recognition of the sovereignty of the newly formed “Republic of Turkey’’ as the successor state of the Ottoman Empire, and the republic was officially proclaimed on October 29, 1923, in the new capital of Ankara. Turkey has been an active and important player in various international organizations. It entered the North Atlantic Treaty Organization (NATO) in 1952 and serves as the organization’s vital eastern anchor, controlling the straits leading from the Black Sea to the Mediterranean and sharing a border with Syria, Iraq, and Iran. Turkey and the Philippines opened embassies in each other’s capitals 13 years ago. There have been several high-level visits including a visit of His Excellency, Sulleyman Demirel, President of Turkey in 1999, and then Vice President Gloria Macapagal Arroyo in 2000. Turkey and the Philippines have signed a number of agreements. The more recent ones included an Agreement on Mutual Promotion and Protection of Investments, an Agreement on Prevention of Double Taxation, an Economic and Technical Cooperation Agreement, and a Memorandum of Understanding on the Establishment of a Political Constitution Mechanism.